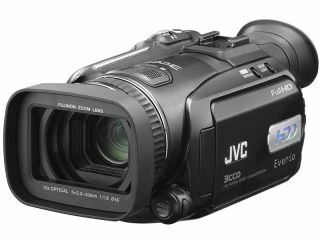 JVC hopes to vastly increase its hard disk camcorder sales, aiming at a 40 per cent increase for 2008, according to the Japanese press. The company plans to sell 2.1 million more hard disk camcorders next year than it's selling currently. The company's Everio hard disk drive (HDD) camcorders were the first of its kind to market in 2004. Since then, Sony has released a number of its own HDD models. JVC may be looking to its newest Everio, the innovative HD7, to help hit its target. The high-definition camcorder is the first in the world to shoot at 1920 x 1080 for true high-definition video. Since Sony released its HDD range, JVC has lost ground in the HDD camcorder market. The company had previously announced it wanted to secure 50 per cent of the market, according to CamcorderInfo .